Catie surprised me with this in the mail -- and I was wowed. 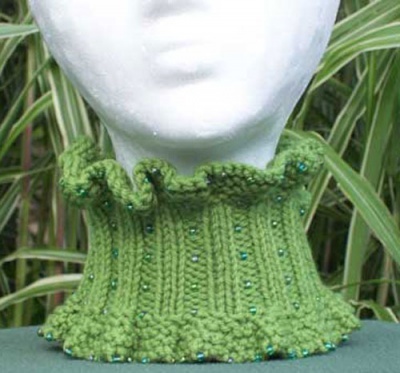 I immediately slipped it on and I love it -- such a lovely little neck warmer and so comfortable. And I must say (ahem!) that it looks great on me. 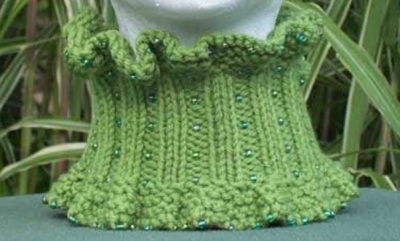 "You'll take a shine to this fancy neck warmer with sparkling bead accents! Wear it to accessorize a sweater or top, or as an extra cozy layer inside a blazer or coat. Either way, it's a lovely and luxurious touch. 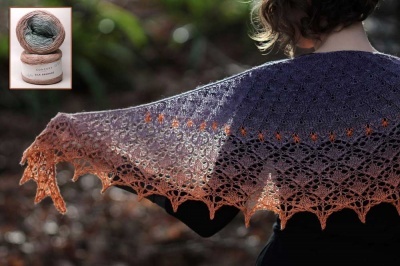 A super easy pattern you can knit in an evening or two. Since it takes only 100 yards of yarn, why not use something extra special?!!" A great little gift item, yes? 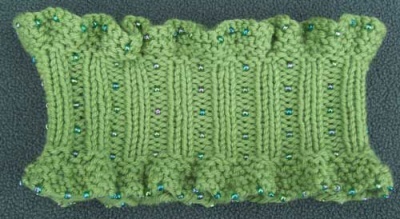 And a wonderful small project for summer knitting -- easy to take with you and requiring not-too-much attention to knit. You will want a dk weight yarn (about 100 yards) and about 170 beads that can be threaded onto the yarn. Catie used 6/0s but 5/0 triangles or the 4mm or 5mm megatatamas could be superb as well. BTW, we just noticed that Jojoland's Rhythm should work most excellently for this design --and the gradual changing of the colors would make it even more lovely!